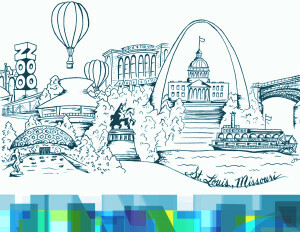 St. Louis coloring page by Jessica Hiklin. Would it surprise you to learn that our own Forest Park is almost a third larger than Central Park in New York City or that it routinely ranks as No. 1 city park in the nation on “best of” lists? We’re lucky to have our campus in a city like this. Whether you’ve lived here your entire life or are just coming in for school, there’s much to explore—with many of the options being completely free. Stroll through the penguin and puffin coast at the St. Louis Zoo, see a Broadway tour production on the stage of the Fabulous Fox Theatre or smell the orchids at Missouri Botanical Garden. Indulge in St. Louis’ expansive food scene with delicious barbecue from one of our signature smoke houses, try some Thai curry at an ethnic eatery on South Grand or learn about third-wave coffee on Jefferson. Get placed at internships that matter. Students find employment and internships at Pfizer, Sigma-Aldrich, St. Louis Cardinals, St. Louis Blues, politicians, advertising agencies, Edward Jones and other industry leaders all within the city we call home. We could go on and on about the wonders of the city, but instead we’d like to show you. Here’s a snapshot of St. Louis, produced by our friends at Grain—a St. Louis creative firm that loves our city just as much as we do.